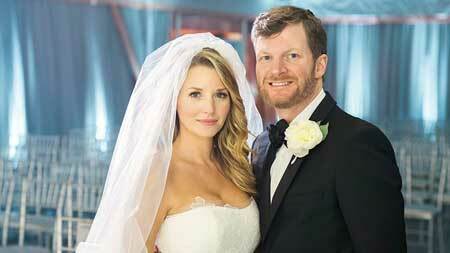 Amy Reimann married the American professional car racer and radio personality Dale Earnhardt Jr. in the year 2016 after dating for a while and concluding her first marriage with Tommy Cook. Are they happy with their relationship? let us find out!!! Amy is happily married to her second husband Dale lately on 31 December 2016 at Richard Childress' Childress Vineyards in Lexington, North Carolina and celebrated the new year eve in a fascinating way. Dale announced his marriage with Amy soon after he won his 14th Most Popular Driver Award in 2016. Amy met the love of her life for the first time when she took an assignment to decorate Dale's home. During the time, Amy had just finished her graduation in Interior Designing. They did not reveal their relationship in public and media until they made their first public appearance together at NASCAR Awards in 2011. The couple got engaged after six years of dating on June 17, 2015, at the Lutheran church and even shared photos of their happy moment among their fans. As per the National Enquirer, Amy gave him a deadline for their marriage. The couple is not expecting a child yet but they are definitely planning to have them. As per Dale, he will not name his son Dale Earnhardt III in the family. As the pair has already picked a name for their future child. Before linking up with Amy, Dale had a romantic relationship with his ex-girlfriend Kimberly McCullough in January 2009. The couple maintained their relationship for two years. However, later, she got engaged with actor Jason Cook in August 2009. Reimann and her husband revealed about the difficulties they faced in their relationship and how they grew up since they first met and started dating in 2009. "Me and Amy were having a hard time figuring out how to make our relationship work… Every day was like grinding gears." "Just a lot of tension and disagreement and misunderstanding, and there were great times — and then there were days when we would both sort of withdraw and get frustrated with each other and not communicate and hold grudges." Earnhardt confessed that he's an immature person and that created a great problem in his married life. "He said so many times for so many years that he just wasn’t gonna get married." "But he wanted to have kids and so I told him, ‘I get you not wanting to get married. We don’t have to get married, but I’m never having children with you if we aren’t.’"
Despite some ups and downs, in the beginning, the couple is living a happy and blessed life together. Amy was still married to her husband Tommy Cook, UK Assistant Football Coach when she encountered Dale for the first time. Tommy and Amy met in the college where he was an impressive football player and Amy was an appealing cheerleader. Their conjugal life was going on so well until Dale trembled their relationship. "My son won’t talk anything about his marriage to Amy, but we confirmed this tabloid’s story." Amy and Tommy got their life on a single path in the year 2008 but their relationship was, unfortunately, short-lived. Tommy and Amy decided to conclude their conjugal life with a divorce and eventually, Dale proposed Amy to marry him during a trip to Germany in June 2015. Amy was born on March 25, 1982, in Texas to the family of Jeffrey and Anna Reimann. In 2005, she finished BS in Interior Design from the University of Kentucky. Amy successfully became the project coordinator-interiors at the Wakefield Beasley and Associates but ended with it in 2009. She dedicated herself as the Director in Micamy Design studio in Charlotte in 2010. As Amy and Dale have completed four months of their successful marriage, we wish the couple all the very best for their perpetual relationship.